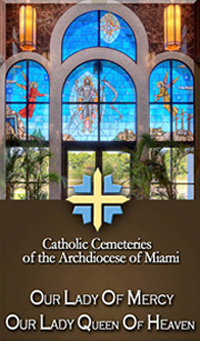 Consecrated in 1959, two Archdiocesan cemeteries serve the faithful of South Florida with Catholic burial. Making a Catholic Cemetery your choice is one final and lasting way to affirm your devotion to your faith and to your loved ones. For more than four decades, the Church has provided the Catholic South Florida community with a sacred enclosure for those who have lived within the faith and a measure of comfort to those who come in bereavement. Catholic Cemeteries perform a sacred function on behalf of the entire Christian community. They serve as symbols of the extended community of believers, a community unbroken by death. Each cemetery, one in Broward County and one in Miami-Dade County, consist of 125 acres designed, developed and landscaped to provide a setting of beauty and tranquility. They offer traditional ground burial, lawn crypts and niches for cremated remains. Columbaria are also located in the beautiful marble and stained glass chapel mausoleums, where remembrance Masses are celebrated regularly.